Lots of fitness and wellness worlds come with their own complex languages. Here, we teach you the basic vocab you’ll need to communicate (and look cool) during your first indoor cycling class or in any future situation where the indoor cycling-obsessed can be found (dinner parties, work water cooler, etc). 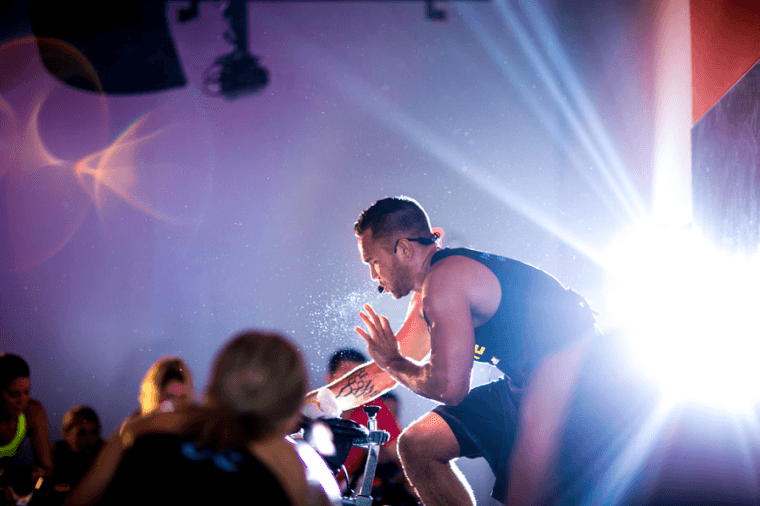 Even if you’ve never been to an indoor cycling class, given the workout’s super-rise in popularity, you’ve already seen some of these terms etched across a sweaty SoulCycle devotee’s shirt, or heard them in conversations between to friends waiting in line for their Mean Green Liquiteria smoothies post-Flywheel. Position (gear): This refers to where your hands are placed on the handlebars, and most studios have three variations: First position is at the base of your handlebars, parallel to your hips. Second is on the outside of the handlebars at the base. Third is on the top two points at the end of the handlebars. The majority of studios use the term position, but Cyc uses “gear” and also has two additional ones: Fourth is on top of the arch bar in the middle of the handlebars (not all bikes have this). Fifth is on the two middle bars, with your elbows resting on the base of the handlebars. It’s way easier when the instructor shows you at the start of class, we promise. Resistance: This essentially refers to how hard you have to push in order to move the pedals. On low resistance, it’ll feel like you’re flying downhill, wind in your hair. On max resistance, it will feel like you’re pedaling through mud uphill—and you may feel like crying. Brake: This is knob underneath the handlebars, and it’s how you control your resistance. Turning it to the right will increase your resistance. Turning it to the left will decrease it. Hudoba says you should never ride with zero resistance: “Always add at least one to two turns of the knob to maintain stability.” It’s also your emergency brake, and you can press down on it to bring the pedals to a rapid stop, should you suddenly realize you’re more of a yoga person. Bike shorts: What are those? Indoor riders wear the padded Spandex thigh-skimmers of road cyclists zero percent of the time if they’re women, and a tad more frequently, if they’re guys—Usually also under a pair of basketball shorts, we’ve noticed. Saddle: The seat. If you’re riding out of the saddle (and at some point in every class you will), it should almost always be right under your hips. An easy way to double check that you are over the seat is to make sure that your knees are behind the brake. Power: Studios that are more metrics-based (Flywheel and Revolve, for example, as opposed to SoulCycle or Cyc) often have a number they calculate to help you keep track of how hard you worked during class. It’s a number that combines how much resistance was on your bike with how fast you were moving in some way to calculate the overall force you exerted, and they may call it “Total Power” or “Swerve Score” or a number of other things. All of this is to say, if you want to get fit, you want the number to keep getting higher, so pedal hard. Clip-in: A direction from the instructor to secure your cycling shoes onto the pedal, and, yes, there are special cycling shoes. Most studios provide them, either for free or a small rental fee. Your first time clipped in, it will probably be tough to clip out, but you can just slip your feet out and leave the shoes on the bike if you need to. It happens to the best of us, really. Basket or cage: The strappy contraption attached to the pedal that you’ll slip your sneaker into if it’s a studio where clip-in shoes aren’t provided or used. Set up: The adjustment of your bike to your body. “Bike fit” is also used. When standing next to the bike, the saddle should hit directly at the hip, and when you hold your elbow at the front edge of the saddle, your fingertips should just graze the front bar. Handlebars should be level with or higher than your seat, so your spine stays neutral. You should definitely ask for help on your first few rides—it’s tricky to get the position right yourself. And there’s no shame in struggling to lift the 45 pound handlebars or to lower the seat down a few pegs from the giant riding before you: Instructors circle the room to help with set up before class as a matter of course.